Hello friends. I have a great story to tell you. It's a tale that has never before been told the story of the Hemp fields of Pennsylvania. Did you know that the original Hempfield Township in Lancaster County, Pennsylvania was named for the vast amounts of hemp raised there, and was raised on virtually every early farm in Pennsylvania? Hemp was a vital necessity and was grown by all of the early settlers of Pennsylvania. 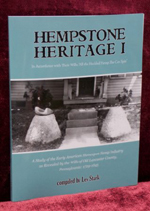 I invite you to learn the fascinating details of the old Pennsylvania hemp industry in the Hempstone Heritage Series. By analyzing many primary documents I was able to come up with a unique perspective of the old hemp industry. What I have found is a story nothing short of amazing! After several thousand hours of research I am now able to bring the story of the Pennsylvania hemp industry to the world. Between the years of 1720-1870, there were over 100 water-powered hemp mills lining the streams creeks and rivers of Lancaster County alone with dozens of hemp mills in neighboring York County. There were dozens more hemp mills in all of the surrounding counties. There were almost as many oil mills for processing hempseed and flaxseed oil. The Hempstone Heritage Series reveals to us all of the fascinating details of this once thriving industry. Hempstone Heritage I: In Accordance with Their Wills; All the Heckled Hemp She Can Spin, A Study of the Early American Homespun Hemp Industry as Revealed by the Wills of Old Lancaster County, Pennsylvania: 1729-1845, is the first book in the series which will unveil ground-breaking research into the old Pennsylvania hemp industry. Resolutions in favor of hemp have been passed by the Lancaster Farm Bureau, the Pennsylvania Farm Bureau, the Pa State Grange and the Pa Farmers Union. There is strong popular support for hemp farming in Pennsylvania. Learn how a revived hemp industry could benefit farmers, create jobs and to help stem the tide of destruction in the Garden Spot of the World, Lancaster County, Pennsylvania. One dollar from the sale of every book goes to Lancaster Farmland Trust to help preserve our farmland.